Have you played games in the backyard? Sometimes you were imitating glorious battles, but time to time guild and neighbor clans compete with each other. 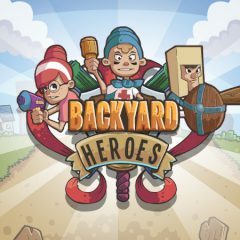 Grab your weapons and defend your backyard from neighbor kids! All kids dream about becoming great warriors, the brave knights who will fearlessly deal with different enemies and creatures. But sometimes, even true warriors complete with each other, because they defend their own territory. Your backyard is your home and the backyard of your neighbor is another kingdom. Who will own these lands in the end?